Dyeing Dart Frog is a species of poison dart frogs known by the scientific name (Dendrobates tinctorius). Another name that it is referred to as is the Dyeing Poison Arrow Frog. The frog, although not born with it, has a toxic poison that it can secrete. The frog gains the poison from what it eats. Certain insects that are in their diet have the poisons and the frog obtains the poison from them once it eats that insect. 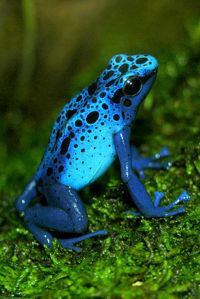 The Dyeing Dart Frog has a very unique color which shows predators that it is poisonous. The colors and patterns on each frog are different. For example some frogs might be black and yellow while others are black and green. The colors and patterns that they display are very unique and are not seen among other frogs. 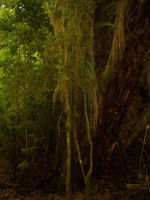 This page was last modified on 22 February 2010, at 15:07.